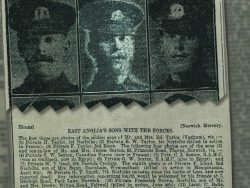 Almost one hundred years after the beginning of the first world war, local historian Daryll Banyard has compiled a brief history of the ten men from Yaxham who died in that conflict. Using various sources, Daryll has pieced together pieces of the lives of these men, and the circumstances in which they were killed in action in battles across the western world world – from the infamous killing fields in France and Belgium to the mysterious disappearance of members of the Norfolk regiment in Turkey to a 1,000 mile march across modern day Iraq. By remembering and honouring the ten Yaxham soldiers who gave their lives in the World War 1, I would like to think that they are not just names on a memorial. My research is by no means complete, and sadly I have been unable to supply much in the way of personal details, photos etc. of the fallen. From censuses, war diaries and databases I have been able to record mostly where they lived before the war, details of their service, when and where they died and the foreign memorials that bear their names. In this way at least, I hope their memory will live on more vividly. Private. 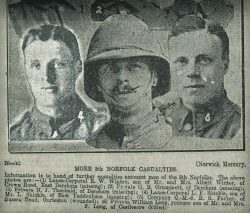 1st / 5th Norfolk Regiment. Buried: Gaza War Cemetry, Israel. Census: In 1911, aged 17, living in Yaxham. Occupation: An engineer, the son of Edmund and Georgina. Born Fakenham. Census: In 1911, aged 15, a farm labourer. The 1st / 5th battalion marched out of Egypt in Feb 1917. They bivouacked in the desert at night and trekked through hot and tiring days in March. On 27th March Turks were spotted on the skyline and they dug in at Mamazua, with instructions given on using gas masks. On 16th April operations began against Shaveh Abbas ridge, which was carried with only slight opposition and 1 killed. On 18th April preparations were carried out for the Battle of Gaza the following day. 19th April 1917. The Battle of Sampson’s Ridge proved to be horrendous for the two Norfolk battalions, after which the survivors joined other units. After two hours of artillery bombing, the 5th Norfolks attacked at 7.30a.m. in artillery formation with one tank behind. They advanced 2000 yards under rifle and big gun fire, the tank flattening barbed wire entanglements. There were severe casualties then and even more when a portion of the enemy’s trenches were entered and Turkish fire hit the tank’s wheels and put it out of action. The counter attack was impossible to resist, the battalion retiring and taking up a position 1500 yards from the Turks. Among the ranks 13 were killed, 174 went missing and 401 were wounded that day, and amongst those lost were Bertie and Walter Curson. By the 22nd April, 9 more Norfolks had died of their wounds. On the 9th Dec 1917 Jerusalem surrendered and this proved to be climax of the offensive against the Turks. Killed in action: Flanders, France 4th August 1916. On signing up his address is given as Lord Nelson Public House. His father George Kent was landlord here between 1913 and 1917. On 4th August 1916 during the Battle of the Somme the war diary for the 2nd battalion reads “Enemy quiet during the day and part of the night. We sent out strong patrols but no enemy encountered.” The 2nd battalion were under bombardment during this time at the front, so David Kent could have died on this day from injuries he received earlier, or from a random trench mortar. Private, 8th Battalion Royal Fusiliers. Killed in action in Flanders, France, 9th April 1917 aged 31. Son of Henry and Mary Ann Eke, Norwich Road, Yaxham. Awarded 1914-1920 British War Medal and 1914 – 1919 Victory medal. In 1911, Henry was a vermin destroyer and William a farm labourer. Buried: Feuchy Chapel British Cemetry, France. William was killed on the opening day of the Battle of Arras, just one of a massive number of casualties that day. He was engaged in the Allied plan to break through German defences into the open ground beyond, and engage smaller numbers of the German army in a war of movement. After much planning and tunnelling the time came for going “over the top”, delayed for a day by a request from the French. It was snowing heavily as Allied troops went across no man’s land; they were hindered by large drifts with soft mud underneath. Visibility was poor and it was probably that in these dreadful conditions William Eke lost his life. When the battle ended on May 16th significant advances had been made, but a breakthrough had not been achieved. 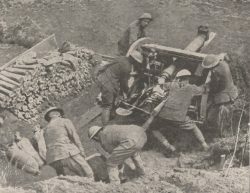 Photograph of British 18 pdr field gun being moved into a new position, Battle of Arras, during the advance near Athies. Private, Bedfordshire Regiment Company, 6th Battalion. Killed in action Flanders aged 27. Son of Frederick and Susannah of 91 Clint Green, Yaxham. Awarded 1914 – 1920 British War Medal and 1914 – 1919 Victory Medal. In 1901 and 1911 living with his parents and brother Ernest (see above). Aged 21 in 1911. James fought and died in the battles leading up to Passchendale. After the British success of the capture of the Messines ridge in June there followed 6 weeks of glorious weather, but then it rained all August and bombardment destroyed the field drains, so water couldn’t run away. The earth turned into thick, glutinous mud, foul with the decay of dead horses and corpses. James’ battalion took part in the intense fighting along the Menin Road (20th September), Polygon Wood (26th September) and Broodside (4th October). On the day James died it rained incessantly and the ground became too soft for stable gun platforms. Shells disappeared into the mud, either failing to explode or having their force absorbed by the mud. James’ battalion’s War Diary for October 7th reads: “Heavy artillery bombardment of German front line. “A” Company pushed forward patrols to ascertain if enemy was still holding his position – he was! Inter-company relief took place – 10 O.R.’s killed.” One would have been James. Rifleman, London Regiment (Queen Victoria?s Rifles) 1st / 9th Battalion. Killed in action: Flanders 9th October 1916 aged 24. Son of Frederick and Susannah of 91, Clint Green, Yaxham. Awarded 1914 – 1920 British War Medal and 1914 – 1919 Victory Medal. Census: In 1901 and 1911, living with parents Fred and Susannah (and brother James, see below) aged 19 in 1911. 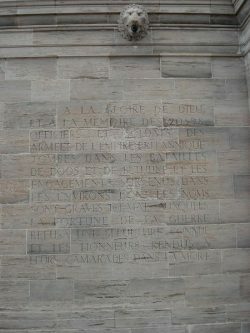 Memorial – Thiepval Memorial, France. On the day Ernest died his Battalion were defending Bemafray Wood on the Somme. After the mayhem of the first days of July when 57,000 men were lost, and when Bemafray Wood was taken by the Allies, the scene was one of shattered tree trunks and flooded shell holes. I have not found evidence of a major battle around the 9th October so assume Ernest died from sporadic fire in the mud filled trenches here. 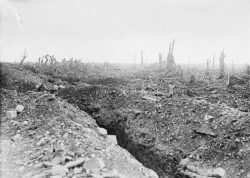 The badly shelled main road to Bapaume through Pozieres, taken 3 weeks before Ernest was killed. Lance Corporal, 1st / 5th Norfolk Battalion Regiment. Died: Gallipoli 12th August 1915 aged 22 (married aged 18). In 1901, living at 31 Low Street, Hockering with parents Lambert and Alice and siblings. In 1911, aged 18 living in Dereham with Hugh and Gertrude Fanthorpe and family, an assistant to a Hay and Corn merchant. Lewis’s name also appears on the war memorial at North Tuddenham church. I have been able to contact Charles Shickle. Lewis was Charles’ father’s brother, and Charles lived in North Tuddenham from 1920 to 1960, but could not explain why Lewis’s name appears at Yaxham. After training, Lewis left Liverpool aboard the ‘Aquitania’ en route for the Dardenelles. After idyllic weather through the Mediterranean, it was a shock to arrive at Mudros Boy, with 100 war craft and big hospital ships lined up. 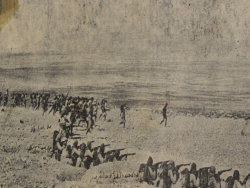 They transferred to smaller vessels and on August 10th embarked at Suvla Bay, with just 2 days’ supplies of biscuits and bully beef and a warning they would be thirsty so to keep a pebble in their mouths. The brigade’s vague objective was to clear the country, but the terrain was difficult. Dense stunted oaks gave excellent cover for Turkish snipers and in the brushwood on the first day, many were shot down. The 1st / 5th Norfolks went forward at 4.45p.m. on August 12th after an hour of naval bombing. As the brigade advanced there was considerable confusion. The Norfolks pressed forward more quickly than the other regiments and became detached from them. Fighting became very intense, men were exhausted, but 250 men and 16 officers from the Norfolks pushed on. They were last observed charging into a forest, never to be seen alive again. Their bodies were discovered on 23 September 1919 in a ravine 800 yards behind the Turkish lines. It wasn’t until fifty years later in 1965 that the horrible truth of the fate of these men was revealed – they had all been shot in the head. The total casualties of this day’s action by the 5th Norfolks were 22 officers and 350 men, one of which, somewhere along the line was Lewis Frank Shickle. By the end of August, the Norfolks had moved further down the Gallipoli peninsula, and by December the Allies had retreated from Gallipoli. The total Dardenelles casualty number was 25,000. Private, Norfolk Regiment, 1st Battalion. In 1911, aged 24, living in Dereham, horseman and farmhand. Born in Yaxham. Memorial: Faubourg D’Amiens Cemetry, Arras. In March 1916, the roads on the Western Front were impassable, troops having to drag their transport up hills as horses were unable to keep a footing. In these conditions, the 1st Norfolk’s took up position in front line trenches North East of Arras, straddling the road to Bailleul. The German bombardment of the 1st June wrecked the left trench of the Norfolk’s front. On the 2nd June bombs fell on the trenches on the right, killing four and wounding eight. Ernest was either one of these four or died from wounds inflicted the day before. On the 4th June, the enemy exploded two large mines on the Norfolk front, followed by an infantry attack which was costly in life loss, but the Norfolks held their ground. Extracts from divisional orders show the action was appreciated and how important it was that the high ground was held. Died: 19th Nov 1917 aged 38 in the Persian Gulf. Awarded: 1914–1920 British War Medal, 1914–1919 Victory Medal. Parents: Thomas and Anna Vincent. Wife: Kathleen Vincent, 14 Baltic St, Golden Lane, Barbican, London. Buried: Baghdad (North Gate) War Cemetery, Iraq. Without factual knowledge, the action leading to the death of Frederick is one of the more difficult to pinpoint. Frederick fought against the Turks in Mesopotamia (Iraq) as part of the Indian Expeditionary Force; their task was to drive the enemy towards Baghdad and to secure Basra and its hinterland for the Allies. The Garrison Artillery Heavy Battery took part in the battle of Kut in November 1915, and was part of the Force besieged there for 5 months. The Relief Force sent to free them was repelled by the Turks and 12,000 troops surrendered when conditions became intolerable. Of the 2,500 British troops, only 750 returned; 2.5 years later; at the end of the war. The troops were forced to march 1,000 miles to their prison camps in Anatolia, and the 1,750 who died, either succumbed on the march, or in the camps, where dysentery and malaria were rife. It is probable then that this was the fate of Frederick. Died: 18th October 1918 of wounds, Flanders, France, aged 42. Parents: Walter and Augusta Woodrow, Norwich Rd, Yaxham. Buried: Grevilliers British Cemetery, France. In April 1918 the Allies were defending an area North of Meteren, Flanders. The 1st Middlesex received reports the French had advanced and were South of Meteren. They sent patrols into the village, but the reports proved false and they were fired on with fatalities. There then followed several German attempts North and North East of Meteren, which all failed. It is likely that it was during these last actions of the war that Arthur Woodrow received his wounds from which he died on 18th October, three weeks before the ceasefire. Thank you so much for all your hard work, I have 3 great uncles on this memorial and had been struggling to understand how to find the records at the national archives. We owe so much to these men, they and the sacrifice they made must never be forgotten.